Hello fellow Wayfarer van-fans, my name is Andy. I live in Oregon with my amazing wife Ericka and our two dogs/kids, Bella and Sage. To say that Ian and his team at Wayfarer have let us live van life to the fullest, is an understatement. Growing up in Montana, I’ve always enjoyed being outdoors in nature and fortunately for me, my career has given me the opportunity to follow my passion. For more than 16 years, I’ve have had the pleasure of working at some of the best destination mountain resorts in North America. My career in the ski industry has taken me from Heavenly and Alpine Meadows in Lake Tahoe, to Big Sky Resort in Montana, and onto my most recent stint at Mt. Bachelor in Oregon. The ride has been amazing and I enjoyed every day. At some point after many years on the mountain, the work/life balance got out of whack and started to take the fun out of skiing for me and knew I needed to make a lift choice, so I pursued a gig with 10 Barrel Brewing also located here in Bend, where I’ve pursued another crafty passion of mine; beer! 10 Barrel Brewing was the best of both worlds because it is an active outdoor beer brand, allowing me to work with a wide variety of outdoor companies as well as working with a team of athletes and also prioritizes enjoying life outside with a work hard, play hard culture. The beauty of living in Bend is being able to enjoy life outdoors all four seasons (the only place I’ve lived where you can ski or mountain bike almost every month of the year, while also being able to make a surf trip to the coast if the weather craps out or the skiing or biking conditions aren’t ideal) I know – super spoiled and first-world problems. 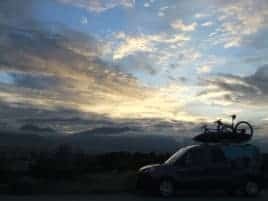 I’ve never purchased a new vehicle and had been driving a 1990 Toyota Pickup for almost a dozen years and loved it, babied it, and never thought I’d sell it, but the van life was calling. 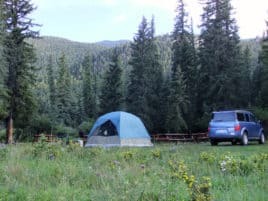 The appeal of camping in any weather condition or time of year and not crawling into the back of the truck to camp with a couple dogs sounded pretty nice. Just like most van enthusiasts, we searched for many months and looked at a variety of new and used builds, and were sticker-shocked by the cost of some of these pre-equipped vehicles, so we continued looking and came across Wayfarer Vans after the right search on Google looking for more of a pre-build and turnkey solution. After reading reviews about the company and its products, we were sold and redirected our search to find a ProMaster. In March 2018, we purchased our ProMaster at Perkins Motors in Colorado Springs. As I mentioned, this was my first new vehicle purchase and was a little cautious, but was stoked to find a couple vans on order built to fit the Wayfarer kit and got to pick our color (dark grey). Perkins Motors is one of Wayfarer’s local dealership partners and the integration and partnership led to a seamless buying experience. 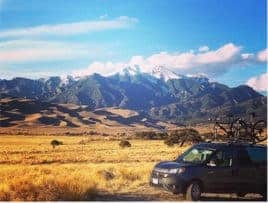 We purchased one-way tickets out to Colorado and our new ProMaster was delivered the day before (tight timing on buying the plane tickets – but worked out), and Ian had the full van set up in less than a day and our “Walter” van build was ready right when we arrived. Now named, the “Grey Whale”, we’ve had a blast and driven over 13,500 miles since March. We have spent nearly every weekend (literally) doing trips to the coast where we’ve been building a yurt on a lot walking distance to the surf. Regardless of sun, rain or snow, we have put our pedal to the metal and have hit the proverbial road with confidence and in comfort looking for our next adventure. We have been to Moab for a friend’s wedding and some mountain biking, but most of our adventures have been in and around Oregon. While the “Grey Whale” has been a more comfortable and spacious way to travel and camp than our pop-up camper shell on the Toyota, my favorite thing about owning a “Walter” van is that we are now able to take treks in the winter, which in the past, would have not been possible. The first trip we took after driving “Walter” home to Oregon was to another local ski hill, Hoodoo Mountain for night skiing where the forecast was calling for a couple feet of new snow and had been dumping all day. After an evening of endless powder runs and closing down the bar, we stayed in the resort’s parking lot and couldn’t believe what we woke up to the next morning – 16” of fresh, snow-white, pristine powder. It was hands down the best powder day of the season – and wouldn’t have had that experience in the past without the ability to camp overnight in the van. Another amazing memory is when we drove to the Oregon Coast to surf at Otter Rock earlier this summer. We pulled up and parked next to another ProMaster and they too were sporting a Wayfarer interior, one of Ian’s first “Walter” builds! Of course we toured each other’s vehicles, swapped stories and are now Facebook friends. Overall, “Walter” is an amazing addition to our family and we are super excited for more memorable adventures. In fact, we are planning our vacation next spring to ski the San Juan’s and bike our way back through the Southwest and see the Grand Canyon. We are excited to plan our trip around utilizing our ProMaster to fit all our gear and dogs, something we wouldn’t have been able to do in the past with our old truck (where we’d normally get a flight somewhere new and not be able to bring the dogs). My wife and dogs have had a blast in the first 6 months and nearly 14k miles in our ProMaster and beyond stoked with the Wayfarer “Walter” van build, and looking forward to the many adventures to come! See you on the beach, chairlift, or trails!